Randi has been travelling to the Nordic countries since childhood. Her name, Randi, and her Norwegian grandmother link her to the far North which has become her home. Her studies at the Universities of Kiel, Oslo and Uppsala led to a Masters in Scandinavian Studies, German Literature and English. During this time, she worked for radio and television with an emphasis on documentaries. After finishing university she completed a trainee program for radio and television journalists at NDR, Norddeutscher Rundfunk. Thereafter she became a freelance television reporter at NDR Kiel. She has been living in Stockholm since 2007. As a freelance radio reporter and television stringer she works at the ARD correspondents’ office. Her stories are as diverse as the region, celebrating Swedish midsummer tradition for a radio feature to reporting on the changing foreign and security policy of the Baltic rim. 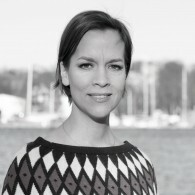 Even if some topics are emotionally challenging, such as the acts of terror in Oslo and the island of Utøya in July 2011, she enjoys working on a broad spectrum of topics, a journalistic “Smörgåsbord”, as she likes to see it. Verlassene Kinder, starke Mädchen. Neue TV-Dokumentation über Astrid Lindgren.